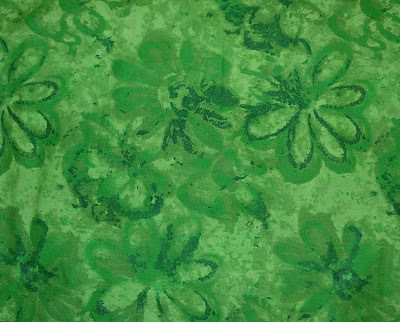 This is my first quilted finish for 2008–Mexico Strings. I quilted this quilt on New Year’s Day and put the last hand stitch in the binding on January 9. 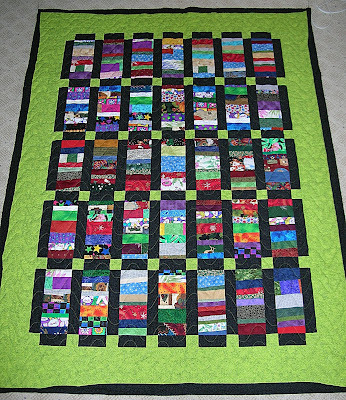 This quilt finished 47 1/4″ x 62 1/4″ and will be making its way to Pam for her Quilts For Mexico project. 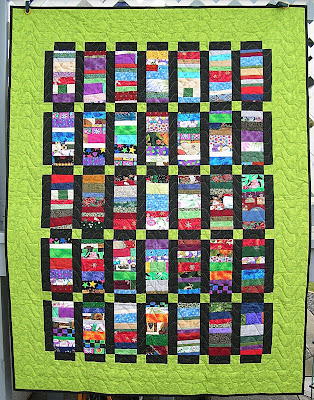 Pam will be taking the donated quilts to an orphanage in Mexico later this year. 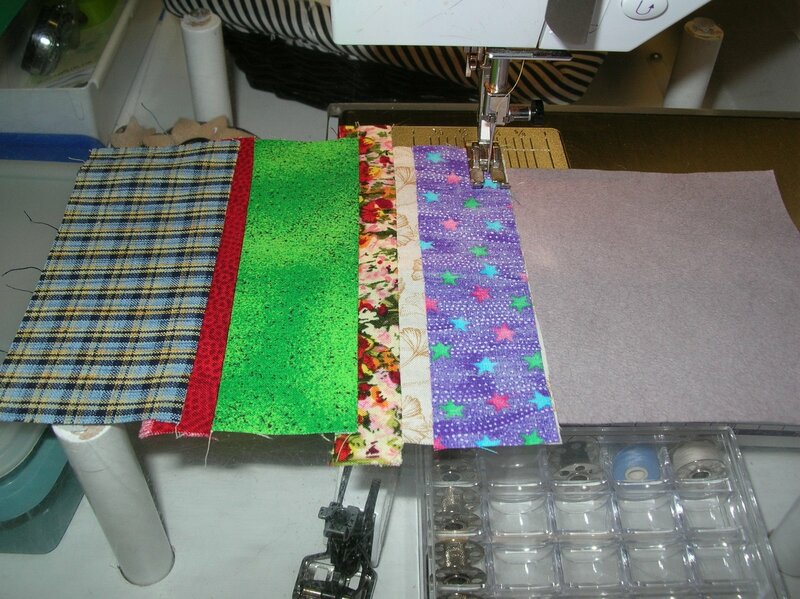 I encourage you to make a quilt and donate it to Pam’s project to help her reach her goal of 200 quilts! 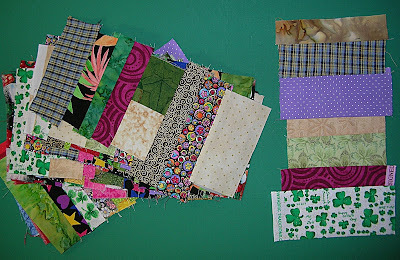 The blocks for this quilt were foundation pieced onto used color catcher sheets. Once the sheets are covered with strings, I trimmed the blocks to 4″ x 9″. 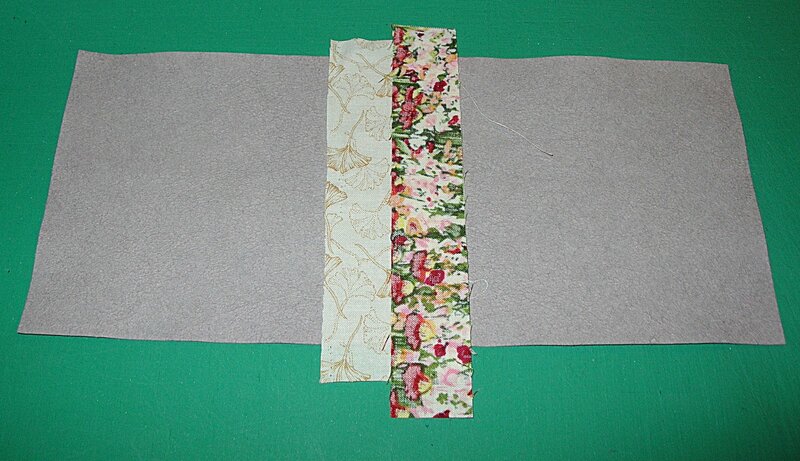 The sashing is cut 2″ x 9″ and cornerstones are 2″ square. The outer green border is cut 6″ wide–no special reason other than that is the width of my ruler (6″) so strips are easy to cut. This is the progress on my projects since New Year’s Day. 1. 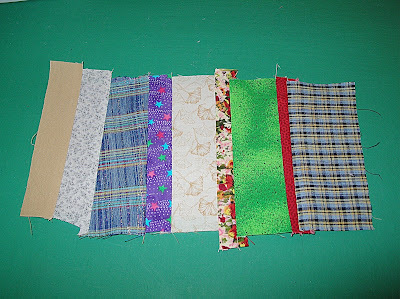 I have pieced another 17 color catcher string blocks. They still need to be trimmed, but that is a job I will leave till an evening in front of the TV. This is an ongoing project. As I have color catchers and strings of fabric, I continue to make these and store them in a box. When I have enough to make a quilt, I sit down and piece the top. I will never run out of string blocks, nor will this project ever end. 2. This is the color catcher string quilt that I quilted on New Year’s Day. It now has a binding machine sewn to the front. 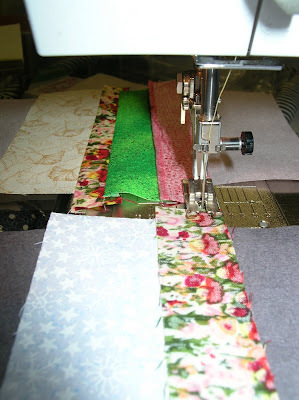 All this quilt needs is the hand work to fasten the binding to the back of the quilt. I will be taking this project with me to work on at my Monday night quilt group. 3. This is my dryer string diamond quilt. 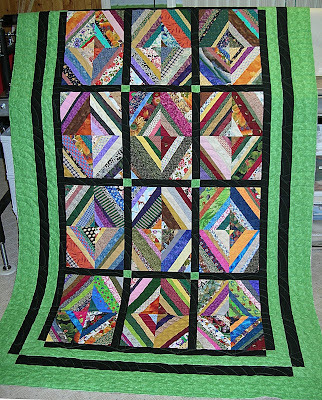 I finished this quilt to the flimsy stage back on May 27, 2007. It was time it was quilted! I quilted it using the Baptist Fan template. This one just needs the binding now. 4. This is my Christmas Patience Corners quilt. I worked on adding blocks to this one in the last couple of days. Currently this top is 73″ wide. I bought some backing on Friday (from the last of the bolts left from Liquidation World’s sale) that was 108″ wide. 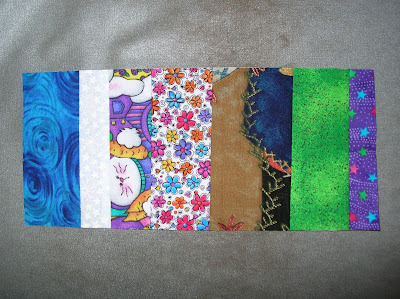 I think I will make this quilt as wide as I can to make maximum use of the backing. That means I will likely need to add another 1 1/2 blocks (if you count a group of four squares as a block) to the width of this quilt for a total of 7 1/2 blocks in width. I started this quilt top back in December 2006. This is a picture of the wide fabric that I bought for the back of my Patience Corner quilt. It is bright and wild. Those flowers are at least 10″ across. I think I mentioned before that bright green is my new favorite colour! 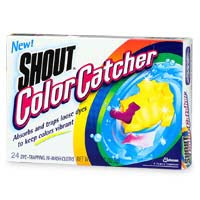 I have discovered the most wonderful product–Shout Color Catchers. I now launder all my quilts with this wonderful product to keep dyes from bleeding or running onto other fabrics in my quilts. I have also started using these sheets in some of my regular laundry loads and I just love them. 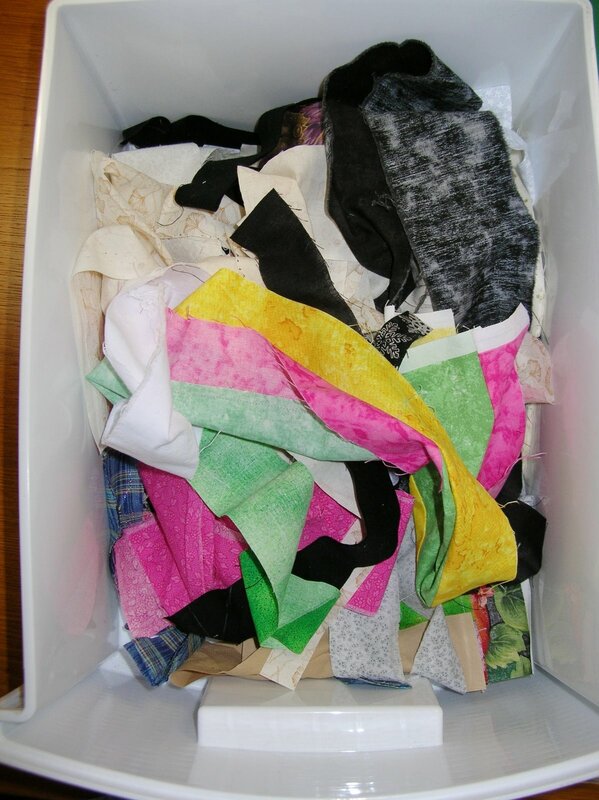 However, I started to accumulate a stack of used color catcher sheets that I couldn’t bear to throw away. What do you do with all those used sheets once they have trapped all that loose dye? I use them as foundations for string pieced blocks. 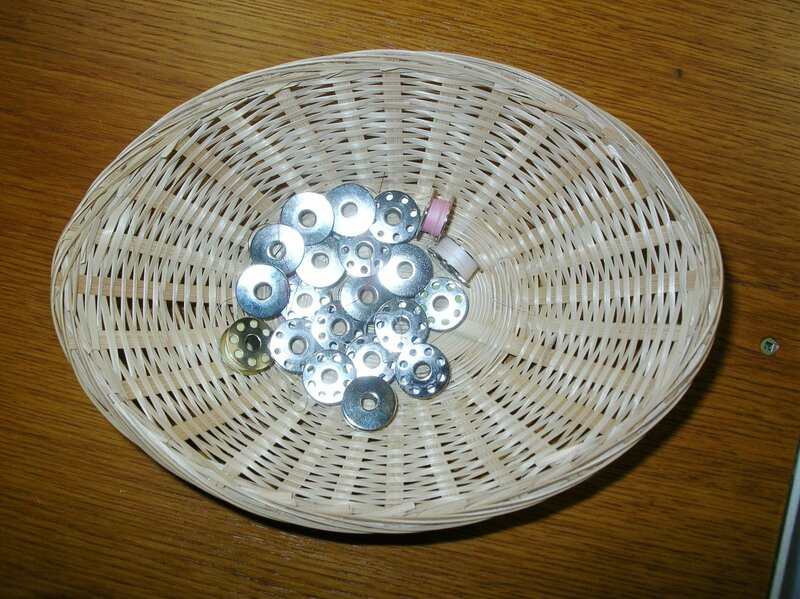 I am a long arm quilter and I don’t like to throw away the bits of left over bobbin threads left from quilting customer quilts. When I am finished a quilt, I take the bobbin out of the long arm and throw it in this basket. The bobbins that fit my long arm do not fit the bobbin area of my DSM. 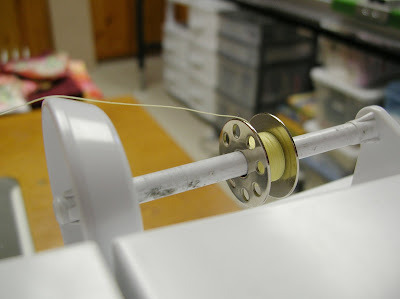 However, those bobbins can be used on my DSM in place of the top thread. Because I am going to use these threads in a “stitch and flip” technique to piece my string blocks, the colour of the thread does not matter. 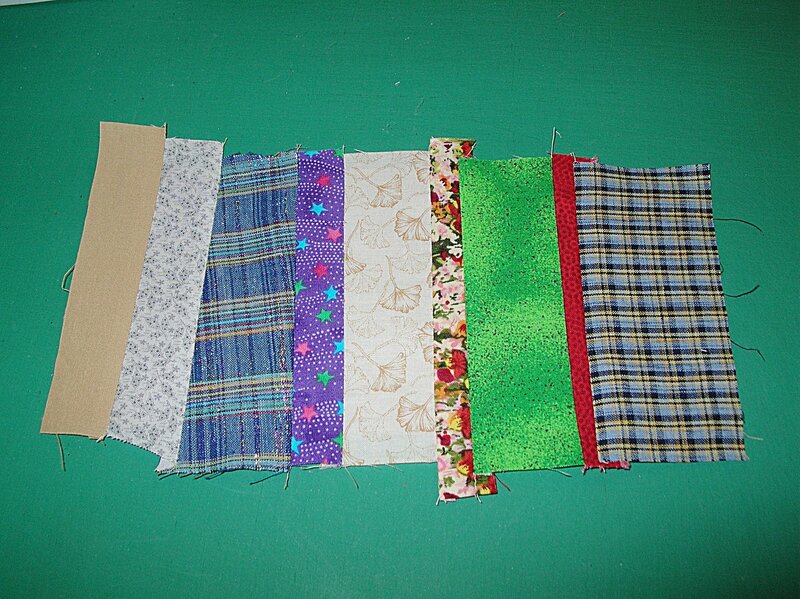 The object of these blocks is to use up threads and fabrics that would otherwise be thrown away. These are some of the color catchers after they have been through the wash cycle. 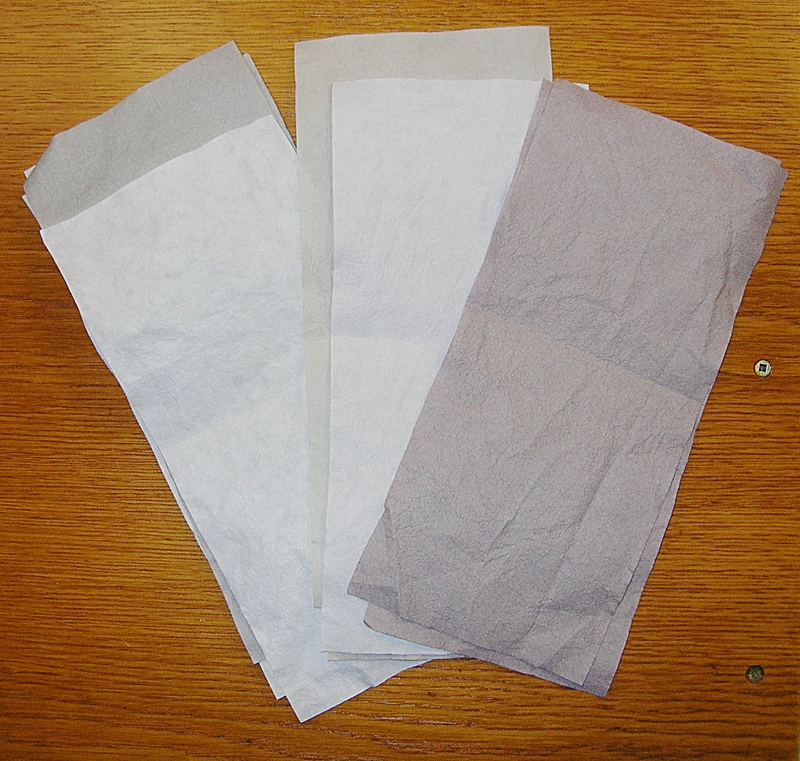 Yes they are different colours–remember they are used and are finished their intended purpose which is trapping loose dyes in the wash cycle. This is my current box of strings. To start, I lay a string the approximate width of one of the color catchers across the middle of the color catcher. Then I lay a second strip on top of the first strip – right sides together, aligning the edges of the strips on the right side of the strips. 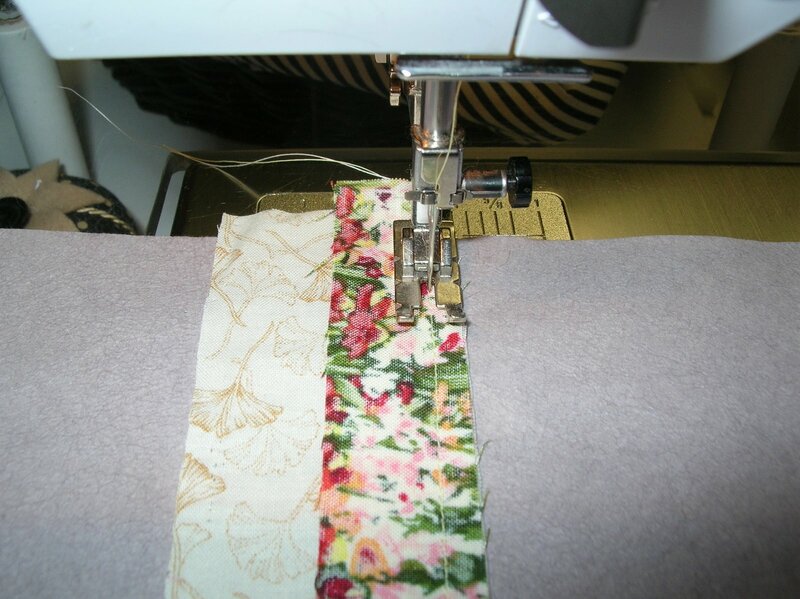 Sew a 1/4″ seam down the right edge of the strips. If your seam is not quite a perfect 1/4″, don’t worry. This is a very forgiving technique and as long as the fabric is captured in the seam, you will be fine. Once that first seam is sewn, press the strip to the right and continue adding strips to the right of the last piece sewn in place. Stitch and flip, press, and repeat until the right side of the color catcher is completely covered with fabric strips. 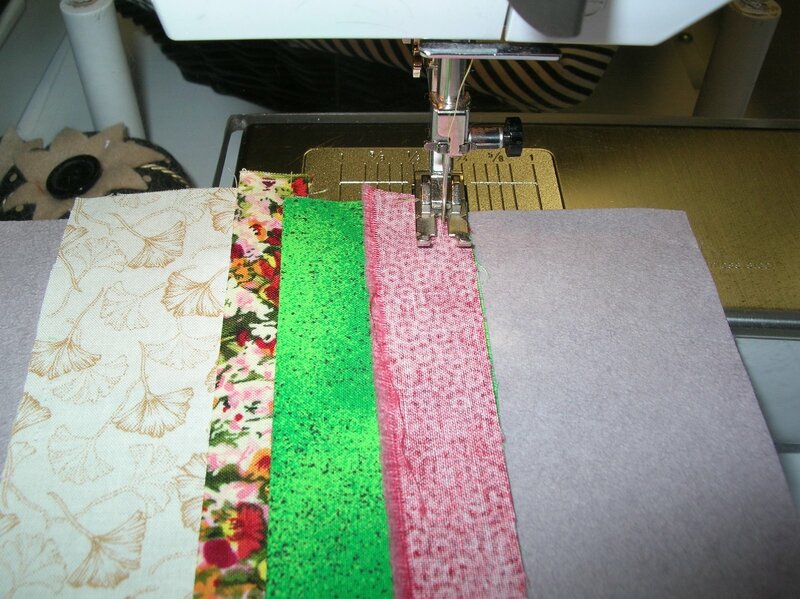 To further maximize your thread usage, work on more than one block at a time and chain piece through the machine. Once the right side of the color catcher is covered with fabric, turn the color catcher and add strips to the left hand side of the color catcher in the same manner that you covered the right side of the color catcher until the entire color catcher is covered with fabric strips. This is what a finished block looks like–a little ragged on the edges. Flip your block over so that your color catcher is right side up. Align your ruler and trim the block to the size you want. I have been trimming my blocks to 4″ x 9″. No special reason for the size–it just seems to make the best use of the color catcher. These are some blocks ready for trimming. 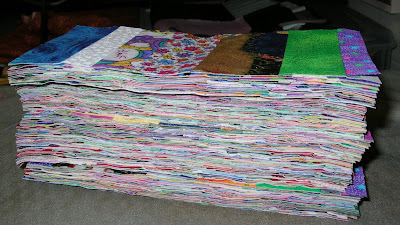 Before you know it, you have a stack of blocks ready to be set into a quilt top. This is an excellent technique to use up fabric and thread that would otherwise be headed for the trash. This is also a technique that is a little “mindless” and works for those evenings that I am too tired to concentrate but when I still have a “need” to piece or sew.